This is a normal one-week trekking itinerary for the Tamang heritage trek. We make a shorter or longer trek for this. We also make the combined trek itinerary of Tamang heritage Langtang trek itinerary, Tamang heritage Langtang Gosainkunda trek itinerary, and Tamang heritage Langtang Gosainkunda pass trek itinerary as your interest and vacation. You fly into Kathmandu at the Tribhuvan International Airport, and you will be transferred to the trip hotel of your choice. Enjoy the evening at an authentic Nepali restaurant with a glimpse of culture and heritage as you are invited to partake in a welcome ceremony. Overnight stay at a hotel in Kathmandu. The second day in the capital city, we take a tour of the city for a sightseeing tour while pointing out all the interesting facts you are likely to miss. With 3 UNESCO World Heritage site visits planned for the day, we start off with Pashupatinath, and head onto Boudhanath while finally visiting the Basantapur Durbar Square. You can also visit the Monkey Temple, Swayambhunath, if time permits. Overnight stay at a hotel in Kathmandu. Day 03 : Drive from Kathmandu to Sybrubensi (1500m.) 6-7 hrs. As we start our road trip, we head onto remote hills with settlements like Trishuli Bazaar and Dhunche along the way. The road to Sybrubensi is a tight affair with most of it narrow and bumpy and not the best in the country. While it is challenging during monsoon with the tracks carved out as a ridge in the hills all muddy, these roads make the trip enticing with the ravines and valleys and Trishuli river flowing terrifyingly below our track. Overnight stay at Sybrubensi. Day 04 : Trek from Sybrubensi to Gatlang (2238m.) 5 hrs. The fourth day of Tamang Heritage trekking in Nepal begins with our taking on the trail with an ascent along the Trishuli Valley up North. First stop for the day, a viewpoint that offers majestic views of Langtang range, Ganesh Himal (7422m), Shishapangma (8013m), and Gosainkunda range. Another couple of hours along the valley dotted with Chortens and prayer flags will walk us to Gatlang. Overnight stay at Gatlang. Day 05 : Trek from Gatlang to Tatopani (2607m.) 6-7 hrs. The trek starts from Gatlang village as we descend along the valley to Thambuchet. We cross over a suspension bridge onto a trail ascending up to Tatopani. The name Tatopani meaning Hot Water suggests us to take a dip in the soothing water after a day on the trail. 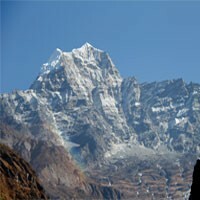 You will catch a glimpse of Ganesh Himal and Langtang Lirung (7227m) as you hike up. Overnight stay at Tatopani. Day 06 : Trek from Tatopani to Nagthali (3165m.) 3 hrs. Headed for the highest point of the Tamang Heritage trek, we take on the trail to Nagthali. 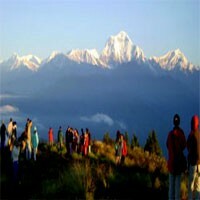 It is hilltop grassland, high and open, with majestic views of Ganesh, Langtang, and Kerung range among others. We start the ascent from Tatopani cutting through lush green alpine forest and arriving at Brimdang village. We then ascend further to Nagthali village. Overnight stay at Nagthali. Day 07 : Trek from Nagthali to Briddhim (2229m.) 7 hrs. 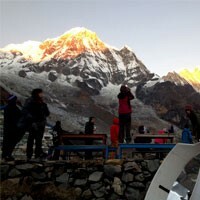 Today will be the longest day of Tamang Heritage trek itinerary as we start with a descent to Thuman village. We continue on a flat trail while descending to Timure (a trade point in route to Tibet). We pass through rhododendron forest and descend further to Briddhim. This is another village with a strong Tibetan influence housing the Dukchu Monastery. Overnight stay at Briddhim. Day 08 : Trek from Briddhim to Sybrubensi (15000m. )4 hrs. Wrapping up this distinct trek exploring the Tamang heritage trail in Langtang region of Nepal, we head back to the starting point of this trek, Sybrubensi. We start along the Bhote Koshi River heading upstream before crossing over to the other side of the valley and heading back downhill through terraced fields. Passing by the meager settlement of Wangyal we descend further to Sybrubensi where we end the Tamang Heritage trek. Overnight stay at Sybrubensi. Taking the Pasang Lhamu Highway, we retrace our road back to Kathmandu. This time we head out of Sybrubensi following the Trishuli River downstream and climbing up the serpentine road and following the track along the ridge. Once in Kathmandu, we check back into our hotel before we venture out into the Thamel market and experience the Nepali hustle on the penultimate day of this trip. Farwell dinner with Frolic Adventure team at typical Nepali restaurant. Overnight stay at a hotel in Kathmandu. With a short window up for grabs early in the morning, venture out for last minute souvenir shopping and stroll before a tour representative arrives to receive you from the hotel. Assisted in checking out, you’ll be transferred to the Airport where you catch your flight back to your destination.